I finished my Gone Fishin quilt over the weekend. 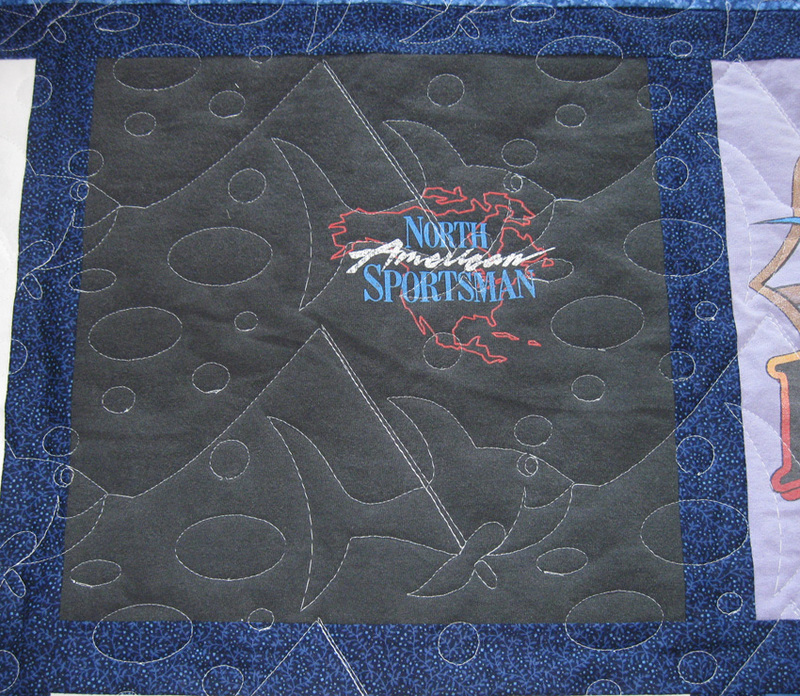 I combined two different quilting designs to the quilt. One was a repeated single fish that came with the free designs of the HQProstitcher and one that a friend (Hi Linda) made for me of a few random bubbles. 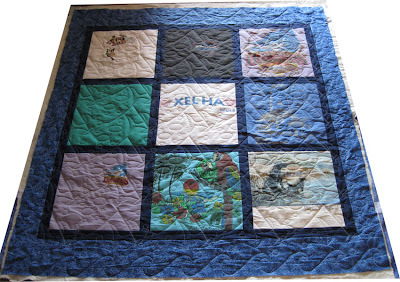 I quilted the whole thing with the fishes first and didn't like the "space" between the fishing poles and the fish above. So, I asked my friend to help with digitizing a few bubbles. I did not want lines between the bubbles so I asked for jumps between them all. I knew that meant a lot of snipping threads between each bubble on both front and back. The photos above and below show the end results. It's always difficult for me to photograph the quilting. I hope you can see it a little. In addition to the fishing pattern and bubbles patterns, I also placed random singular bubbles everywhere. One other thing, of course I did not line up the patterns and had extra space at the bottom of the quilt. So, I added some water waves at the very bottom for the fishes. I have had this quilt top for a while. It is a memory quilt of my brother's TShirts. He loved to go fishing down on the Outer Banks. He especially loved going over to Ocracoke Island and hanging out at Howards Pub. If you are ever down at Howard's Pub, tip one for "Mike". Trish - Awesome quilting with the fish design!